Based in Melbourne, on the Mornington Peninsula, Indigo Pools is a leading swimming pool and spa building company with 40 years of experience in the swimming pool industry. Creating swimming pool environments, which adopt styles of the past, present and future, Indigo Pools designs remain true to elegance, balance, form and spatial awareness. Indigo Pools’ expert team combines cutting edge building technology and innovative one-off designs to deliver projects of absolute architectural excellence. Guided by SPASA’s code of practice, Indigo Pools’ philosophy is based on establishing long lasting relationships with its clients by providing personalized, impeccable service from the initial conceptual stages to the completion of the project and ongoing clients’ support. 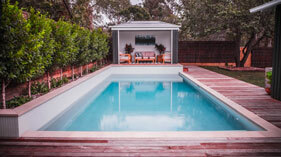 Indigo Pools proudly utilizes Australian made and energy efficient swimming pool products. Based in Mount Eliza, Indigo Pools is a family owned swimming pool construction company with more than 40 years of experience in the industry. We construct unique and exceptional concrete swimming pools. At Indigo Pools, OUTSTANDING and PERSONALISED service is not something of the past, but a conscious decision we make every day. Based in the Mornington Peninsula (Mt Eliza) and servicing throughout Metropolitan Melbourne, Indigo Pools is an inground concrete swimming pool builder with more than 39 years experience in the swimming pool industry. Indigo Pools' reputation for quality is built on integrity, reliability, pride and respect for our clients. Our vast portfolio and customers' referrals are a genuine mirror of excellence in performance and service. We understand that opting to build a swimming pool is a major decision for you and your family. Utilizing the latest in pool construction techniques, suiting your lifestyle and budget, our experienced team facilitates dedicated service and absolute commitment to each project. From site analysis and selection of the best materials to the completion of a superb swimming pool, qualified experts are involved at every stage of the construction process to ensure that the end result is a magnificent pool of structural excellence. Indigo Pools' takes pride in its solid reputation for quality its excellence in performance. Indigo Pools' philosophy is built on integrity, pride and respect for our clients. For us, SERVICE and TRUST are not something of the past, but a conscious decision we make every day. 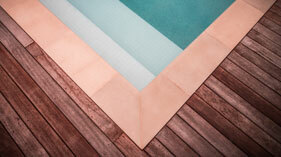 At indigo pools, we build quality inground concrete swimming pools. We pride ourselves in understanding our customer's needs and the importance of service. Building an inground swimming pool has many challenges, and requires an experienced and dedicated pool construction business team that you have trust in. In servicing the Mornington Peninsula and the Southern suburbs of Melbourne over the last 33 years, Indigo Pools has achieved, not only, excellence in concrete pool construction but a high reputation in service, reliability and inspiring designs. Concrete swimming pool design brings together many areas of building in order to create the right finished product. High quality inground swimming pools need to be landscaped tastefully to enhance the visual appearance of the surroundings and set the swimming pool as the centre piece of your entertainment area.Our highly experienced team can discuss with you the practical needs of swimming pool design and work out the best solution that fits within your budget.